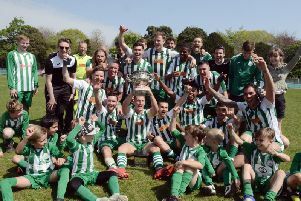 What can Bognor expect when they take on Potters Bar this weekend? Potters Bar are the visitors to Nyewood Lane on Saturday - and Rocks boss Jack Pearce has warned that anyone expecting an easy game for his team doesn't appreciate how competitive the Bostik premier is. The Rocks will look to make it back-to-back league wins after the win at Burgess Hill Town last Saturday. The Nyewood Lane side currently sit in fifth place on 39 points after 25 games, but are 10 points off top-of-the-table Haringey Borough. Potters Bar are in 17th place on 28 points but have lost their past five league games under joint managers Lee O’Leary and Scott Cousins. Away from home the Hertfordshire team have won four and lost seven - and have yet to draw. Their last league success was a 1-0 win at AFC Hornchurch on December 11. They are low scorers - with 28 - but are quite good defensively, with only 32 goals conceded, three fewer than Bognor. They play their home games at Parkfield and were promoted from the Bostik north last season. The club were formed in 1960 as Mount Grace Old Scholars and changed their name to Potters Bar in 1991. The Scholars’ top scorers are Bradley Sach and Dernell Wynter, who have scored nine each in all competitions. The last time they met the Rocks was on September 29 in a 2-2 draw. The Rocks went two down in 42 minutes, the goals scored by Eoin Casey and Keegan Cole. Bognor fought back through strikes from Dan Smith and Harvey Whyte.